In my early 20s, I started cutting out recipes from magazines and pasting them into a scrapbook. I recently was going through my books and discovered that I had a few handwritten recipes that my Grandma June had given me included in the book. 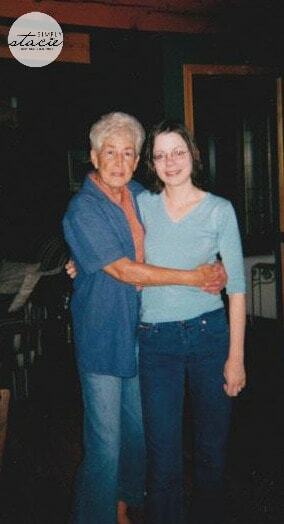 My grandma passed away in December 2012 and not a day goes by that I don’t think of her. I miss her so much that it physically hurts. When I saw her recipes in there, I knew I had to make them and share them in honour of her. 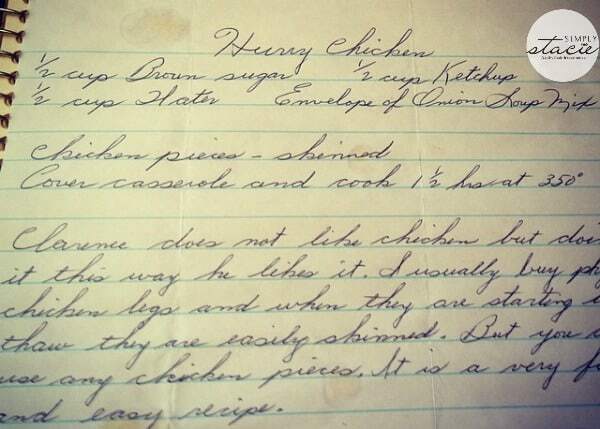 Grandma June wrote a little note on her recipe for Hurry Chicken about how her boyfriend and life partner, Clarence, did not like chicken, but he liked her Hurry Chicken. She said she normally uses chicken legs and removes the skin just when they are starting to thaw. She said this recipe will work with whatever chicken you have on hand. 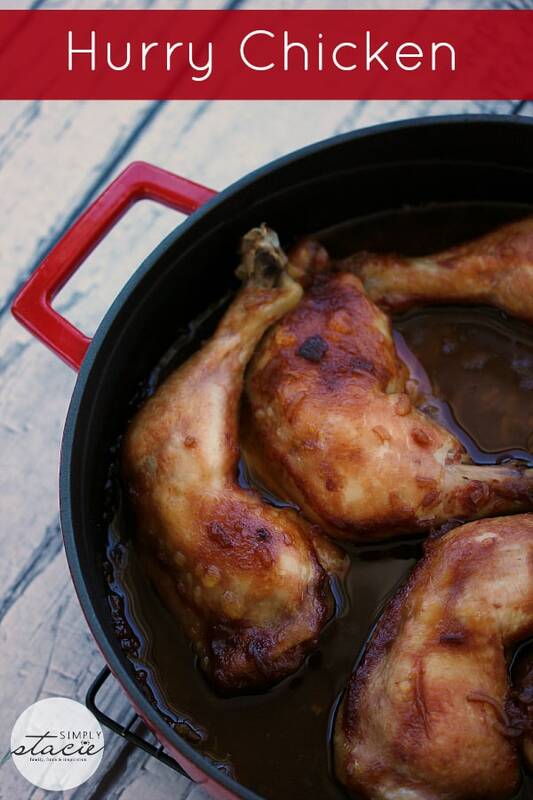 I picked up a package of chicken legs on sale at the grocery store this week and thought it would be perfect for Grandma’s Hurry Chicken recipe. I left the skin on instead of removing. You can always remove the skin after it’s cooked. This way the flavours and juices stay in the meat. The chicken turned out beautifully. The meat practically fell off the bone and even John remarked how yummy it was. I’ll be making Hurry Chicken again not only because it reminds me of my Grandma, but also because it’s an easy and delicious recipe. Enjoy! For more chicken meal ideas, check out these recipes for Chicken Antojitos, Jamaican Jerk Chicken, Honey Garlic Chicken Wings, Easy Chicken Lettuce Wraps, Bacon and Rosemary Wrapped Chicken, Best Ever Chicken Enchiladas and Chicken Clubhouse Bites on Skewers. Juicy, fall-off-the-bone delicious! This recipe was passed down from my grandmother and is always a hit! In a mixing bowl, stir together brown sugar, ketchup, water and onion soup mix. 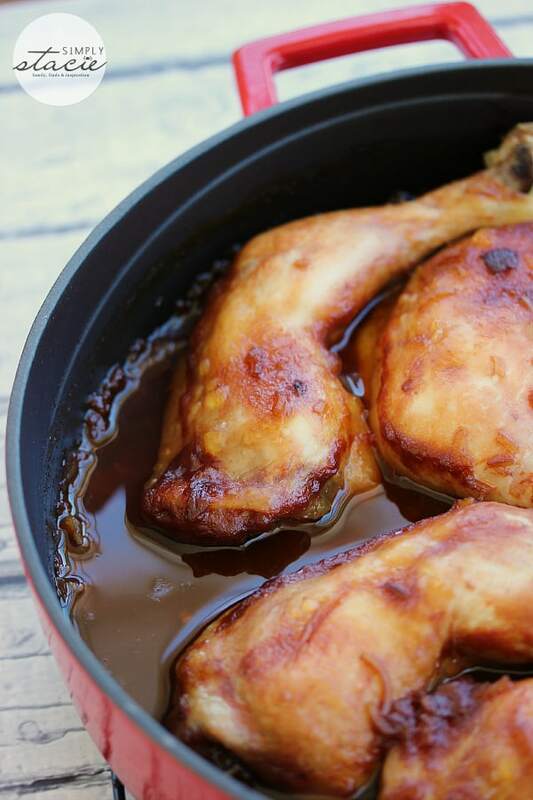 Place chicken in a casserole dish and pour sauce over top to cover the chicken. Put the lid on the casserole dish and cook for 1½ hours. It gives you a warm, touching feeling when you make family recipes. You feel a closeness to the person. It makes the recipe extra special and delicious. Thanks for sharing. This looks so good! I love, Love, LOVE chicken. Thank you for sharing the recipe. What sides do you recommend serving this with? I like it with mashed potatoes! 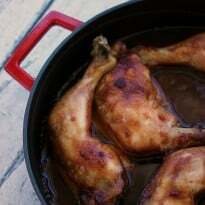 I am always looking for easy chicken recipe’s. This one looks like it may be a keeper for me. What a treasure to not only have your grandmother’s recipe, but to have her comments too. I love the color on the chicken pieces and it’s such a simple/easy recipe. Thank you for sharing. I was just looking for a recipe to use my chicken legs for and found this. It sounds so good. Recipes from our Grandmas are always special! I’m thinking I may try this in the crockpot… Definitely pinning!! I have a book with my grandmother’s hand written recipes in it also, but it’s a little less useful. Some of the recipes call for amounts such as “five cents worth of beef”….. I made this tonight – it was really good. Everyone in my family thought I was saying “Curry Chicken.” Once we got that straightened out, my husband did make some curry to put on his, as well as the sauce that your recipe calls for. Thanks for sharing. Made this for the family tonight and it was delicious!